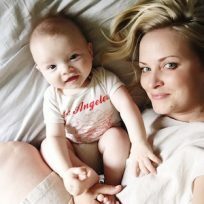 When I was pregnant and getting ready for my first baby, I thought I needed ALL OF THE THINGS, and it was hard for me to figure out which to register for. When it comes to nursing pillows, there are quite a few to choose from. I’ve had the opportunity to try three of the most popular nursing pillows available and wanted to share my thoughts on each. Here are my nursing pillow reviews for the top three nursing pillows on the market. My first baby, Charlie, was a pretty high maintenance nurser—we definitely needed the assistance of a pillow the entire time I nursed him (until he was six months and my supply dried up due to health issues and returning to work). I never felt like the Boppy kept Charlie at the right height or supported him well. Once he almost rolled off (I caught him, don’t worry) while I was trying to adjust my back support, because the pillow is rounded and too soft. When my second baby was born, we had a much easier go with nursing. But I still felt like my Boppy wasn’t supportive enough, and I was having a ton of back and neck pain trying to accommodate for that. I have been told by fellow mommas that the Boppy works better for bigger or older babies, but not so much for infants. I can’t speak to that yet, but I do know that it has never worked for me. So I keep my Boppy in my car for when I am on the go and need to do a quick feeding (it’s better than no pillow! ), but for everyday frequent nursing use, I now use a My Brest Friend. They have the cutest cover options, but in my experience the Boppy is not the best nursing pillow to support babies from age 0-6 months. The pillow that came highly recommended to me in my search for more support was the My Brest Friend. It does have a slightly cheesy name and less cover options available, but I have to give this pillow high marks in comfort and support. The pillow itself is firmer and more level, and has small raised areas that support baby’s head on both sides. It also straps around your waist and has lower-back support. I can literally strap that pillow tightly around my waist and nurse my baby, holding him with one arm, while I tend to my older child. And it is much more comfortable and has eased the pain in my neck and back. The My Brest Friend is the pillow I would recommend that any mother hoping to breastfeed should put on her registry. I also had the opportunity to try a Dr. Brown’s Gia nursing pillow. I’m a huge fan of Dr. Brown’s bottles, so I had high hopes for their pillow as well. While it has an incline that keeps baby propped up, it is still softer and offers less support than the My Brest Friend. It is sort of a hybrid of the two pillows above. It has the same C shape that wraps around your body like the Boppy, but one end is raised to keep baby propped up a bit. It might grow with your baby, allowing for longer use if you are able or choose to breastfeed longer than six months, but is not my favorite for the newborn/infant stage. And for me, having a good, supportive pillow for the earliest stage of breastfeeding (when it is the hardest) is most important. Better than the Boppy but not as good as the My Brest Friend, the Gia works but isn’t my favorite of the nursing pillow options. If you only want to have to buy one pillow and want the most support for those earlier breastfeeding days (0-6 months) get the My Brest Friend.